It’s not quite a shake so we’ll call it a shimmy. I’ve been making these for years for the Onions and calling them Banana Milkshakes. They have no idea. 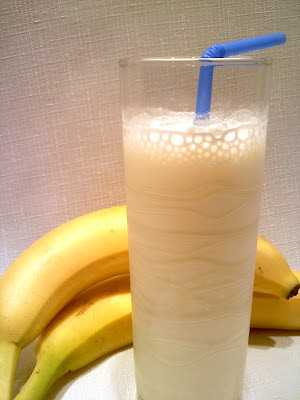 But really, the combination of rich whole milk (which I think is necessary to achieve that milkshake-like consistency) and the creamy banana makes for quite a velvety, rich, frosty treat. I have no idea if I'm right about this but I think there's enough fat in the whole milk that you get a bit of whip going on like you do with cream. That's why you whip the milk before you add the ice. It really does get pretty thick. And… I even looked up the nutritional values for you and guess what? These babies are low in fat and calories and high in protein. Holla! Add bananas, milk, sweetener and a drop of vanilla extract to a blender and whip for about 30 seconds. Add ice and blend for about 10-20 seconds or until smooth. Pour and enjoy! *If your bananas are super ripe you may not even need to sweeten these. I use Splenda because that’s what I keep at home but feel free to use comparable values of your sweetener of choice. 1 8-oz. serving equals 125 calories, 4 g fat, 20 g carbohydrate, 1.5 g fiber, 4.5 g protein. I used to make these for my kids. I would throw in about a cup of OJ or some strawberries. Awesome. The Groupie Wife and I are were just talking about making homemade smoothies for the little Roadies. This is AWESOME.